UGA is the latest atypical contender to get a shot at a title in the playoff era. Through the first three seasons of the College Football Playoff, the field has been largely comprised of bluebloods, with one “interloper” per year making an appearance as well. In 2014, the interloper was Oregon. Michigan State filled the role in 2015 and Washington was your interloper of choice in 2016. But what about in year four, when seemingly all four names are among the biggest brands in college football? Well, it’s the Georgia Bulldogs. That’s not to say UGA is without resources or fan support or history — quite the opposite. The Dawgs have all of those things. But that’s what also makes them the best-positioned interloper yet in this playoff era. Look back at the previous teams to fit the bill, and (other than not being SEC teams) there was one common bond: Not being recruiting powers. Obviously Oregon, Michigan State and UW all recruited reasonably well going into those respective seasons. That’s how they won their leagues and ended up in the top four. But recruiting well for those programs — none of which are traditional powers — means top 20/30-level talent. Not top-10/15 level, as championship teams typically pull in. Georgia may not be a perennial national title contender (they have just two top-five finishes since 2003), but they’ve long attracted similar talent to one. The program’s two- and five-year recruiting rankings are both sixth in the country. Talent doesn’t always result in championships, as UGA has proven. But that’s far and away a better roster than what any of the previous interlopers brought to the table. Teams can get past that talent gap to an extent. Oregon’s talent was top-20ish in the two years prior to the Ducks’ 2014 playoff bid, but it was the scheme that set them apart. It took them to the National Championship, but stopped dead in its tracks by Ohio State’s combination of size and speed. Michigan State’s advantage was coaching in 2015, helping its top 25-level talent win the Big Ten (with some luck to also push the Spartans along). That worked well until running into the buzzsaw that was eventual national champion Alabama in a national semifinal game. Last year, Washington was the biggest longshot yet to make the top four. The Huskies’ roster of top-30 talent had the advantage of coaching and an elite defense. That did them no good against the Tide, either. 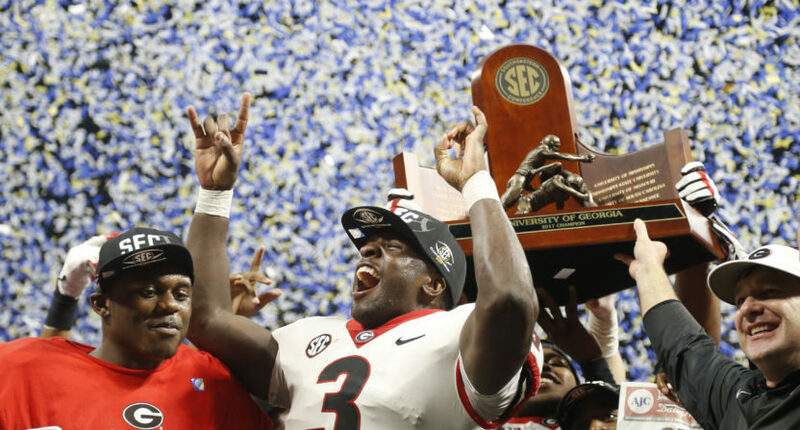 Georgia’s talent is its distinct advantage over those previous teams. 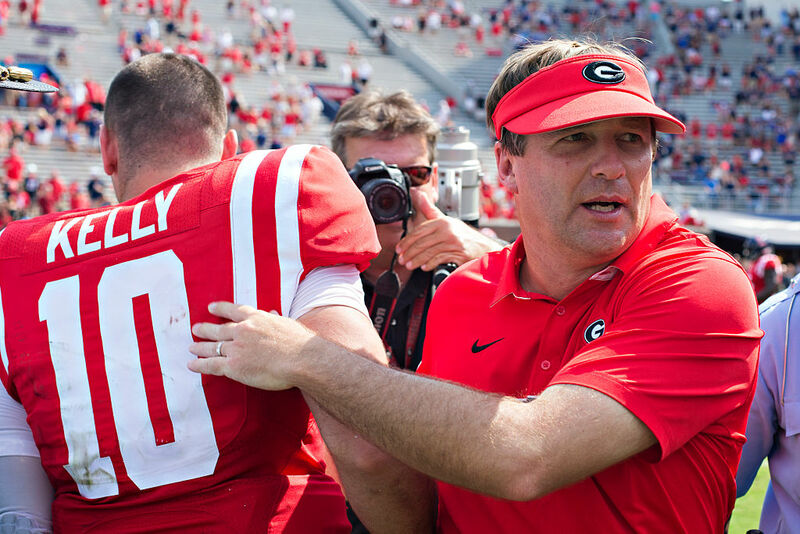 And with an experienced coaching staff (including Alabama-groomed Kirby Smart), the Bulldogs are far better equipped to win the requisite two games to take home this season’s national championship. Also helpful for them: UGA won’t face Alabama in the first playoff game… though they may have to in the second if the Crimson Tide manage to get past the No. 1-seeded Clemson Tigers. But Georgia isn’t just a distinctly good team for a playoff interloper. They’re a distinctly good team by any measure, and have been all season. Set aside the generalizations that may have popped up from a lackluster early November performance against Auburn. Since that 40-17 drubbing, Georgia’s won three straight games by 21 points or more. The icing on that cake? A 28-7 walk in the park against that same Auburn team in Saturday’s SEC Championship. Michigan State’s offensive line was one problem vs. Alabama in 2015. But the bigger issue (and one for every non-Big Ten team) was the lack of speedy (yet larger) playmakers to combat Alabama’s speed on defense. Georgia has not one, but two terrifyingly good running backs. 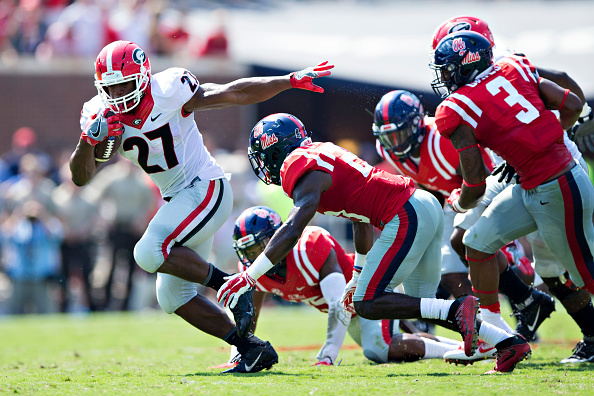 Nick Chubb has nearly 1,200 yards and 13 touchdowns on less than 200 carries. Sony Michel averaged 7.4 yards per carry en route to a 948-yard rushing season. When compared to last year’s Washington, it’s a combination of things. Though obviously Georgia’s biggest advantage there is simply talent. The Bulldogs have defenders on par with what Washington possessed last year. And while UGA’s offense may not be as explosive as the Huskies’ was last season, it’s more physical and punishing — something that’s proven to be pretty helpful in a playoff format. Georgia is the least-favored team in this year’s playoff, but not by an overwhelming amount. Much of that’s due to a tough matchup with Oklahoma, as well as what promises to be an even more challenging game against Clemson or Alabama in the National Championship. This entire collection of teams is about as close to even as we’ve seen in the playoff. That’s largely because of just how strong of an interloper Georgia is. The Bulldogs are an interloper for now, but at one point, you could’ve made the case that Clemson was too. What pushed the Tigers into blueblood territory under Dabo Swinney was increasing returns in recruiting (and Brent Venables’s defense). Georgia’s been recruiting at that level, and now appears to have the coaching to consistently turn that talent into a championship-caliber team. That journey starts this year. UGA doesn’t have to win it all to shed the interloper label, but it would help. In any case, they’re the best-positioned upstart so far in the College Football Playoff. And also the best-positioned to keep that momentum going.